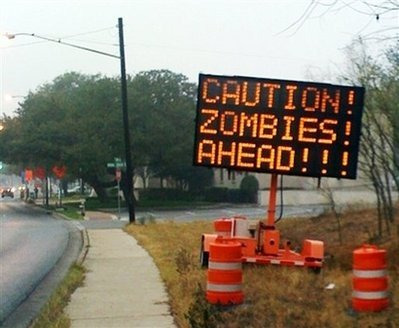 Galaxy 15 Satelite = Zombie Satelite… Watch out for zombies!!! (CANVAS STAFF REPORTS) – Forget the brainless creatures of the night. A provider of fixed satellite services has a high-tech zombie problem on its hands. Space.com and other media reported that an Intelsat satellite is not communicating with ground control and remains out of control. Industry officials stated that it is moving eastward and may cause havoc with other satellites in its path. The Galaxy 15 communications satellite has remained on and its telecommunications payload is still functioning, but it has left its assigned orbital slot of 133 degrees west longitude. Galaxy manufacturer Orbital Sciences Corp. of Virginia is pointing blame to an early April solar storm. The satellite stopped responding to ground controllers on April 5. Aol News reported on Thursday that Intelsat officials studied different tests that they may be able to perform on the satellite to turn it off. They tried but failed “pulsing” it with signals to try to shut it off. According to Space.com , Galaxy 15 is continuing on an orbital path occupied by C-band satellite AMC-11 operated by SES World Skies. Its still-operational payload could cause interference with the SES satellite for two weeks starting around May 23, according to estimates. Space.com stated that company officials tracking the “zombiesat,” a satellite term for a failed satellite in orbit, are now studying whether they can try to shut it down after it passes the AMC-11 and enters a stretch of territory unoccupied by other C-band spacecraft. Yahoo! News reported that a vice president for satellite operations and engineering said Intelsat has sent between 150,000 and 200,000 commands to the satellite in nearly four weeks since it stopped responding. Inselsat switched Galaxy 15 customers to Galaxy 12, another satellite that was moved from another orbital location. GPS World said the satellite broadcasts GPS corrections for aviation and ground users in North America. Intelsat will host a conference call on Wednesday morning to discuss latest on the satellite, according to a report on RapidTVNews .